Stops most wildlife pests and livestock. 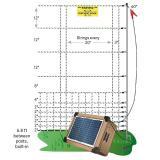 VersaNet Plus has posts every 6.8 ft (vs. 11.5 ft for standard VersaNet). More posts means less sag and a more versatile fence. 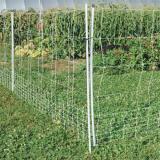 Combines Deer QuikFence and VersaNet 20" design features. Horizontal Spacings 2", 2", 2", 2", 2", 2", 4", 8", 12", 12", 12"
The same “unroll and then unfold” process applies to all electrified nets. Minimal strength or skill needed (and no tools). Extra supports such as SmoothCote™ FiberRod Posts are useful at corners, curves and ends. You will need a fence energizer to electrify the net. Recommended: 3 out of 5 said they would recommend this product to a friend. 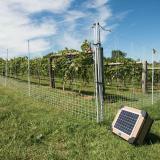 I am pleased with the 60" VersaNet purchased last year to protect my garden, so am ordering another 100' as I expand. Given the 5' x 100' volume of poles and netting, it was a bit awkward to roll out myself, but I decided to give it a try as I knew critters were eyeing my new sprouts. The installation really turned out to be easy once I got it laid out on the ground. The double spiked poles are super easy to step into the ground. My vegetables, fruits, and flowers didn't get touched all season - despite attempts by rabbits, squirrels, racoons, possums, coyotes, deer and even feral hogs! And the birds enjoyed using the fence to watch for insects and the hummingbirds used it as a perch as well. The fence is currently down to store in the barn over winter, so am enjoying having unlimited access to do dirt work and take measurements as I plan next years garden. 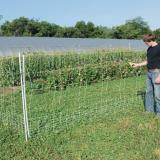 It is so much easier to make changes and adjustments over time with the VersaNet than with a permanent fence. 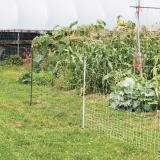 Have about 500' of premier fencing for my goats and love it- was really looking forward to this for the chickens. But I was disappointed to see 2 chickens 'hop' the fence the first day (just between the first bigger space, as it's only about 1.5' off the ground). After 1 month and 25% of the chickens have figured it out - the rest will be hopping out soon. Splurged on the price and regret we didn't go with metal chicken wire with an extended stand of electric to keep out the predators- could have made a comparatively larger pen for the price and rotated less frequently. *Our herd has both wings clipped and the fence has strong power. Terrible. I bought this as a one-size-fits-all solution for keeping out domestic pets and wild predators, the holes are so big my cats jump right through without even contacting the fence, my rabbit dogs can squeeze through by barely brushing the wire in midair and the goats and bigger dogs try to just walk right through because their heads fit so easily through the monster holes. 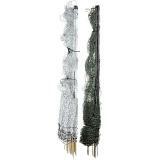 The poultry net is way more worth your money you get way more effective horizontals and 5x more verticals. I'd return this if it didn't cost as much as one whole panel. So happy to have wasted 400 bucks thanks to a totally incorrect comparison chart. 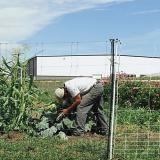 All of Premier's electric net fences are covered by our 30-day money back guarantee. Please contact our customer service folks to arrange a refund. We've only had it for a few weeks, but so far we love this fence! We are using it as a seasonal garden fence, and so far nothing has bypassed or gotten though it. It has been tested by chickens, racoons, and deer, and it stops them all. The setup only took a couple of hours...and that was a from novice like me working alone. Truly not very difficult. As long as it keeps working well, I'm certain I'll be purchasing more fence like this.